Osteoporosis and celiac disease commonly appear together. In fact, it's not unusual for someone in their 40s or even 30s to find they have low bone density immediately after they've been diagnosed with celiac disease. It's important to understand why this occurs (malnutrition related to intestinal damage from celiac disease seems to be the culprit). It's also important to know what you should do if you are diagnosed with both conditions. The word "osteoporosis" is derived from Latin: "Osteo" is Latin for bone, and "porosis" is from a word meaning porous, or spongy. Based on that, you might assume that "osteoporosis" means "spongy bones" or "porous bones"... and you'd be correct. Osteoporosis is a disease in which your bones are less dense than normal. 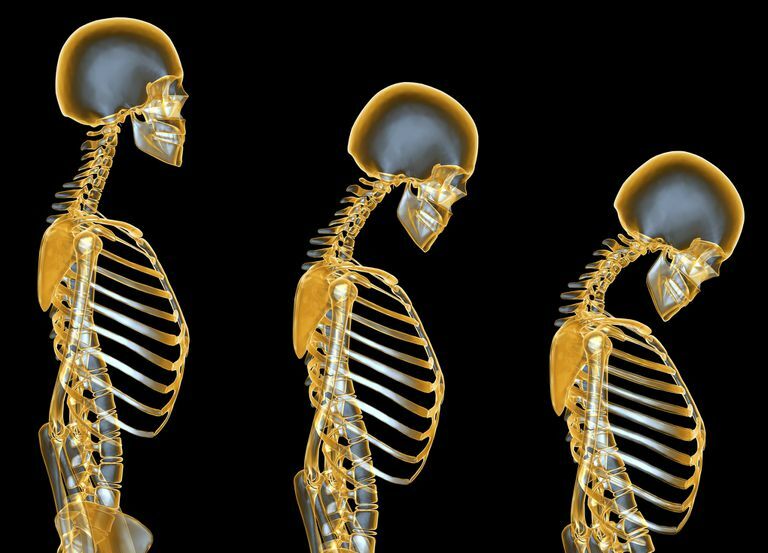 The condition makes your bones more fragile and more likely to break. In a related condition, called osteopenia, bone density is lower than normal but isn't low enough to qualify as osteoporosis. Many people do not realize they have osteoporosis until they break a bone. Sometimes the fractures involve major breaks, such as a broken hip or arm. In other cases, dozens or hundreds of tiny fractures may go unnoticed until a cumulative effect becomes obvious. Loss of height with aging, and the so-called dowager's hump (a severely rounded upper back), for example, are usually the result of many small osteoporotic fractures that have weakened the spine. Fortunately, osteoporosis is preventable. The first step in prevention is to recognize the risk factors for developing osteoporosis. In the following list of osteoporosis risk factors, the first two — "Not enough calcium intake" and "Not enough vitamin D" — are in bold, because nutrient deficiencies are a particular problem in those with celiac disease. When people with celiac disease eat foods that contain the gluten protein, the villi that line the small intestine are damaged. As a result, the nutrients in their food cannot be absorbed properly by the body (a condition called "malabsorption"). Among the nutrients that are not well absorbed are calcium, vitamin D, and vitamin K, which are essential for healthy bones. Therefore, low bone density is common in children and adults with celiac disease. The risk of osteoporosis is especially high in celiacs who were not diagnosed until adulthood (because they have gone longer without absorbing enough calcium and other nutrients). In fact, the link between celiac disease and osteoporosis is so strong that researchers advise everyone who develops osteoporosis at a young age to get tested for celiac disease, to find out whether their low bone density is related to malabsorption. Sometimes, osteoporosis you discover when you break a bone can be the only indication you have celiac disease since celiac doesn't always cause obvious symptoms. Furthermore, researchers also recommend that elderly people with osteoporosis that doesn't seem to respond to medication also should be tested for celiac disease. The American Gastroenterological Association recommends that all patients with celiac disease undergo bone density tests to determine whether they have osteoporosis or osteopenia. These tests are quick, easy, and completely painless. They are often referred to as "bone density scans," "bone mineral density (BMD) tests," or "bone densitometry." Your doctor will need to give you a prescription for a bone density test. There is no specific medical specialty for osteoporosis. In some hospitals, the department of endocrinology or metabolic bone disease performs the test. In other places, it may be the department of rheumatology, orthopedics or gynecology. Some hospitals have osteoporosis programs or women's health clinics that treat people with osteoporosis. Fortunately, once most people are diagnosed with celiac disease and they start the gluten-free diet, their bone density usually improves. Your doctor may tell you that it's not your first bone density test that is most important, but rather, the ones you'll take every few years afterward, because these later ones will show how well your bones are responding to your intestines' improved ability to absorb nutrients. Be sure your diet is rich in calcium as well as vitamin D, which helps your body absorb calcium. Good sources of calcium include low-fat dairy products as well as dark green, leafy vegetables and canned salmon. Vitamin D is synthesized in the skin through exposure to sunlight. The best way to get calcium is to eat foods that naturally contain it, but gluten-free calcium and vitamin D supplements can also help you meet your daily requirements. Ask your doctor which supplements would be best for you. Like your muscles, your bones will get stronger if you exercise. The best exercises for bones are those that force you to lift weight (even just the weight of your own body) as you work against gravity. Walking, stair climbing, and dancing are good. Weight training is even better. Exercise also strengthens the muscles that support your bones and improves your balance and flexibility, which not only makes it easier to keep exercising but also helps reduce your risk of falling and breaking a bone. Smoking is bad for bones, not to mention your heart and lungs. Heavy alcohol use is also bad for your bones. Heavy drinkers are more prone to low bone density (due to poor nutrition) and fracture (because of an increased risk of falling). It's important to quit smoking and limit your alcohol intake. Your doctor might recommend that you take medication for osteoporosis. There are various drugs on the market that are approved to treat low bone density, and it's possible that you might be a candidate to take a medication to treat your condition. Talk with your doctor about the pros and cons of this approach. Presutti RJ, Cangemi JR, Cassidy HD, Hill DA. Celiac Disease. American Family Physician. 2007;76:1795-1802, 1809-10. González D, Sugai E, Gomez JC, et al. Osteoporosis in celiac disease and in endocrine and reproductive disorders. World Journal of Gastroenterology. 2008;14(4):498-505. Stazi AV, Trecca A, Trinti B. Is it necessary to screen for celiac disease in postmenopausal osteoporotic women? Calcified Tissue International. 2002;71(2):141-4.